Hello to all the readers of Visions from for Protection of Animal Welfare Society and we are based in Baku. The rapid and successful development of PAWS in just over one year is thanks to innumerable successful partnerships between Azerbaijanis, expats in Azerbaijan, and interested people worldwide. Elizabeth McCusker, a UK expat, has been the driving force. Her determination to help animals has resulted in the growth of a charity in a way never seen before in Azerbaijan. "Every day in the streets of Baku tens, dogs and puppies which are in need of good nutrition and medical care." This was our starting point in summer 2005. 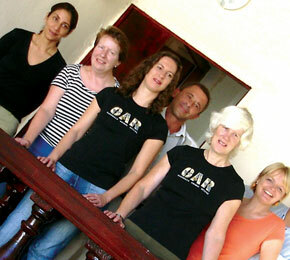 The two founder members of BakuPAWS, Elizabeth McCusker and I, are both from the UK, but currently live in Azerbaijan. Elizabeth decided to set up an organization in Baku which would help these street animals, and asked if I would help her. Of course I said yes, and I’ve written this article to explain how we did it, and what our obstacles were, and how we are trying to overcome them. In the UK there are lots of charities which exist to help animals - indeed the UK is famous for being a nation of animal lovers. But we didn’t want to set PAWS up by ourselves; we wanted to involve Azerbaijani people from the outset so that the charity would be able to continue in the long term without our support. Our first task was to find local animal lovers, and between internet searches and word of mouth we discovered like-minded Azerbaijani people. First we found Azer Garayev who led ASPA (Azerbaijan Society for Protection of Animals) and who wanted to change the attitude to animals in Azerbaijan. Azer had always wanted to do the work of BakuPAWS, and more, but his own extensive work commitments prevented him. Azer has been a wonderful contact, an inspiration, and able to point us in the right direction to obtain official permission to operate as a charity. Simultaneously, through word of mouth, we came across another contact, Nigar Aliyeva, who had been a keen member of ASPA. And Azer also put us in touch with ASPA supporter Mensura, whose continued determination to save animals never ceases to amaze us. BakuPAWS joined WSPA, the World Society of Protection of Animals, and this gave us access to excellent international advice and recommendations. 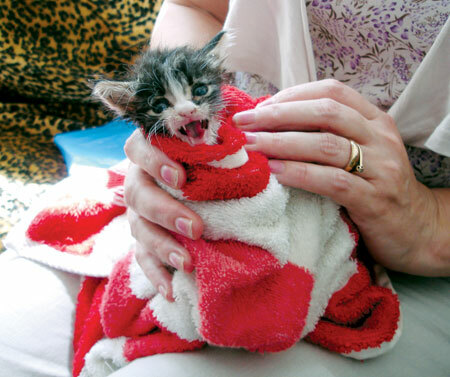 Elizabeth rescued Harry, a tiny little scrap of a kitten, hungry and orphaned. 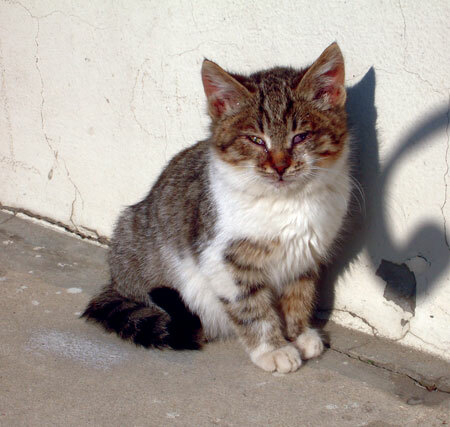 And then Charlie, a scruffy bedraggled kitten, stranded, nearly blind, in the middle of a busy Baku street. We spoke to Dima, an excellent Russian-speaking Baku vet, and found out that helping street animals had long been a dream of his, and that he wanted to work with us. Dima told us about a handsome male cat which had been acquired as a kitten by an expat and when the expat moved on the cat was put out on the street. 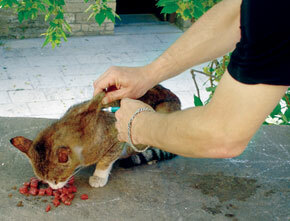 Dima had treated the cat when it was a kitten, and he was shocked to see it on the street. He tried to keep an eye on it, but the poor cat wasn’t used to the rough and tumble of street life, and was soon covered in cuts and bites from fights, and he got very thin. As soon as I heard this sad story I found myself saying, ’It’s OK, I’ll take him,’ and without seeing him I had found us a new flat mate. He’s like a Russian Blue, and we call him Boris, and in time he has learned to trust us and he goes from strength to strength. Elizabeth and I were hooked, and decided to get going with this charity. Before long we were becoming known and we were getting calls about cats and kittens needing help. We had no income. No clinic to take any animals to. What could we do? Dima was doing what he could to help animals on the street, in the back of his car, at home in his kitchen. It was an intolerable situation. We needed to get organised. More and more we heard of sad stories of the plight of street animals of Baku. And some horrible, cruel stories about what was happening to unwanted animals. No more so than on company premises, where stray animals were seen as a hazard and a nuisance. Staff were sometimes being threatened with the sack if they fed the hungry creatures. Elizabeth hit on the idea of funding the work on street animals by offering to look after the animal populations on company land, if they would give us a donation to cover our costs and with the proviso that any extra would be spent on street animals. So far both BP and McDermott have committed to this in various locations and we spend a significant amount of time on this work. Meantime, we decided to look after street animals in their colonies, where they are often fed by local people anyway. We are always pleased at the way many people in Baku care so much for animals – they often feed them and would like to see them healthy and happy. We do not remove or kill any animals like the old cruel methods did. We aim to maintain the animal populations much as they are, and make sure the animals are well fed, medicated and vaccinated against the common diseases. This keeps the animals happy and healthy. Healthy cats are the best hunters, and so this keeps the vermin population under control, which is important in any city. This is the international way of maintaining cat colonies. It is called TNR - Trap, Neuter, Release. Communicating continues to be important in everything we do. 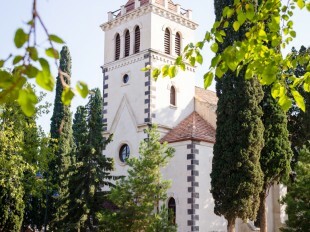 We have the support of the iNBaku magazine, the first glossy English-language magazine in Baku. Every month they publish an article about our work and this has increased our profile enormously. We hold meetings periodically to try and let our supporters know what we are trying to do, and how they can help. We are in regular contact with the relevant Azerbaijani government authorities, providing them with updates on our progress, and involving them in our plans for development, so that in time they will gain the expertise to deal with animal welfare problems in a humane way. We are grateful to them for their interest in, and support for, our work. In September 2006, about a year from our initial ideas about the charity, we were delighted to open our clinic. Coinciding with the opening of the clinic, we were fortunate to be able to welcome two UK vets who came to Baku to train our vet. They also worked with anyone else who was interested in international vet procedures, including other local vets and Azerbaijani government staff. The UK vets were funded by an American based charity, Guerrilla Animal Rescue. This was a huge turning point for PAWS. We now have a clinic maintained to international standards of hygiene, and well-trained staff. 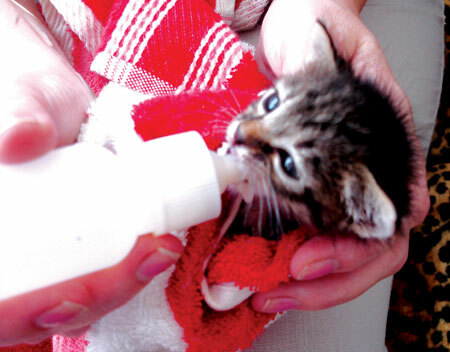 We predominantly look after street animals in the clinic. However a number of animal owners are so impressed with our facility that they are bringing their pets in, by special appointment. They pay money for treatment and the profit from this goes towards our costs with street animals. Problems remain endless - how to get hold of quality drugs for the vet to use, how to source quality animal food, endless amounts of quality cat litter.... from problems like these to the logistics of educating and advising on animal welfare. All this needs to be cheap or free to us, so that we can continue to expand our good work. We need generous and committed sponsors. We need some spacious facilities, convenient to Baku, so that we can cope better with dogs and puppies. Some problems we are overcoming in an innovative way. For instance we needed suitable cages for very sick animals, where they could be protected and safe while they recovered. We get them made at Gizildash Orphanage, outside Baku. The young people make them in a workshop, and so receive training in woodworking skills as a direct result of our requests. All we need now is for someone to offer to sponsor the cost of this worthwhile project. We always have orphaned kittens, and often puppies too, which just would not survive on the street. Where possible we take these animals first to our clinic, for cleaning and medication, and then to our team of foster parents, who will look after them until we find a suitable home for them. All BakuPAWS kittens and puppies are clean and healthy. In the UK some people spend a lot of time choosing what sort of dog or cat they would like. A few people like to choose a pedigree animal, because of its appearance or temperament perhaps. However, most people love mongrels best. A mongrel is a dog which is a random mixture of all sorts of breeds. Some are big, some are small. Everyone agrees that these are the very best dogs. They are the most intelligent, the easiest to train, and definitely the healthiest. Over the years animal charities, like BakuPAWS, have worked to ensure that there are not many stray cats and dogs left in the UK, so that every animal has good quality food, shelter and health care. So where do people in the UK go to get their pets? No kittens or puppies in pet shops there. Instead they can go directly to a breeder to get a pedigree animal, and pay a lot of money, and get to choose the kitten or puppy and see its parents. But most people go to the animal charities, like BakuPAWS, and arrange to take a kitten or puppy that needs a home. These are usually mongrels – excellent pets. So if you are in Azerbaijan and decide you would like a puppy or kitten, then please, think first about contacting our BakuPAWS re-homing service. The cutest of homeless kittens and puppies are waiting for your call. We rely on donations to make our work possible. As news of our efforts spreads, we are gaining an increasing number of supporters, individuals and companies both local and international. Often we are able to publicise their help, and this gets positive advertising for our supporters. People like to do business with, and work for, companies which are kind towards animals. Would you like to support us? We can’t stand to see animals suffering. Can you? A number of people committed to our aims have joined us as volunteers. We all work together on fostering, running the clinic, running the re-homing service, organising our TNR projects, maintaining and developing links with companies with animals on their land, looking after our database of volunteer expertise, organising our finances, writing adverts, newspaper and magazine articles, fundraising, publicity, translating... the list goes on. BakuPAWS, help us to help them. Contact us by email on Bakupaws@gmail.com Or to contact our re-homing service, email bakupawsrehoming@yahoo.co.uk Thank you!